Who was the real Wallis: an opportunistic American social climber, a master manipulator or the true love of Edward's life? Amid the cacophony of condemnation her story has become obfuscated. Untitled is an intimate biography of one of the most misunderstood women in British royal... read full description below. Who was the real Wallis: an opportunistic American social climber, a master manipulator or the true love of Edward's life? Amid the cacophony of condemnation her story has become obfuscated. Untitled is an intimate biography of one of the most misunderstood women in British royal history. His charisma and glamour ensured him the status of a rock star prince. Yet Edward gave up the British throne, the British Empire and his position as Emperor of India, to marry his true love, American divorcee Wallis Simpson. 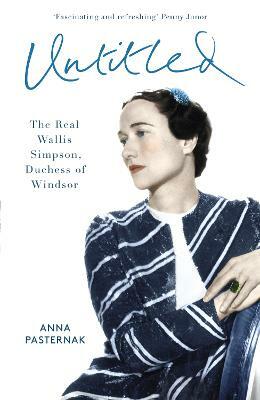 So much gossip and innuendo has been levelled at Wallis Simpson that it has become nearly impossible to discern the real woman. Many have wondered why, when Edward could have had anyone he desired, he was smitten with this unusual American woman. As her friend Herman Rogers said to her in 1936 when news of her affair with Edward broke: `Much of what is being said concerns a woman who does not exist and never did exist.' History is mostly perceived from the perspective of his-story. But what about her story? Anna Pasternak's new book is the first ever to give Wallis a chance and a voice to show that she was a warm, loyal, intelligent woman adored by her friends, who was written off by cunning, influential Establishment men seeking to diminish her and destroy her reputation. As the author argues, far from being the villain of the abdication, she was the victim. Anna Pasternak seeks to understand an unusual, deeply misunderstood woman, and the untenable situation she became embroiled in. Using testimony from their inner circle of friends, she presents a very different Wallis Simpson. With empathy, intimacy and thorough research, this book will make readers view her story as it has never been told before. Anna Pasternak is a writer and member of the famous Pasternak family: her great-grandfather was Leonid, the impressionist painter, her great-uncle was Boris the Nobel prize winning novelist, her grandmother was Josephine the philosopher and her father is revered Oxford biochemist Professor Charles Pasternak. Anna was educated at Christ Church College, Oxford and is the author of a number of books, most recently Lara.